Since 21 November – the beginning of mass protests in Ukraine – 136 journalists have been injured while carrying out, or as a result of their professional activities, according to data collected by the Institute of Mass Information (IMI). IMI monitors, records and verifies information about affected journalists, photographers and operators at mass protest actions and in clashes between protesters, police and “titushki” [paid provocateurs] in Kyiv and other cities of Ukraine. Taken into account were only the cases associated with journalists’ professional duties, and those in which journalists had real injuries or had their equipment damaged. 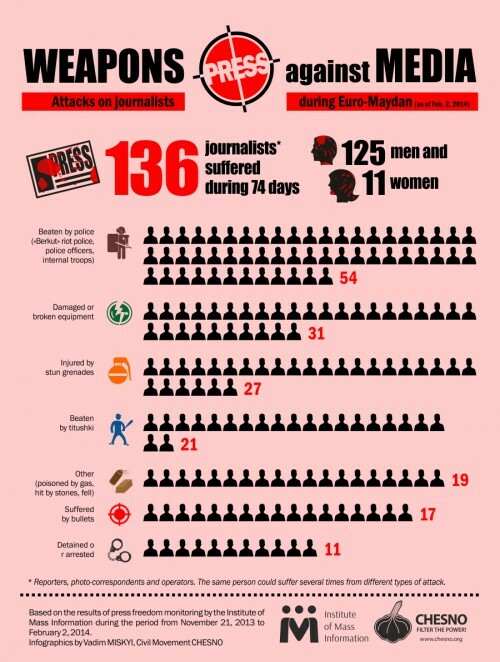 The majority of journalists – 80 cases – were injured in the last 2 weeks (from 19 January to 2 February 2014). Most journalists were injured by police or Berkut soldiers – 54 cases. 27 journalists were injured as a result of the explosion of light noise grenades and 21 media workers were attacked by “titushki” [paid provocateurs]. IMI also recorded 17 cases of journalists who were injured by bullets that flew from the side of police on Hrushevskoho Str. in Kyiv. There were also two cases in which Berkut soldiers intentionally targeted cameras, but their bullets missed the targets. Another 19 journalists were injured as a result of other threats, for example, from stones that were flying from different angles, or were poisoned by tear gas. 31 journalist had their equipment damaged or completely destroyed – camcorders, cameras, tablets, flash drives, etc. 11 journalists were detained or arrested by police. The list of those suffered is constantly updated on the IMI website. *Reporters, photo-correspondents and operators. The same person could suffer several times from different types of attack. Based on the results of press freedom monitoring by the Institute of Mass Information during the period from November 21, 2013 to February 2, 2014. 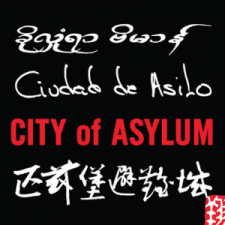 This article was originally published by Ifex.org on February 10, 2014. 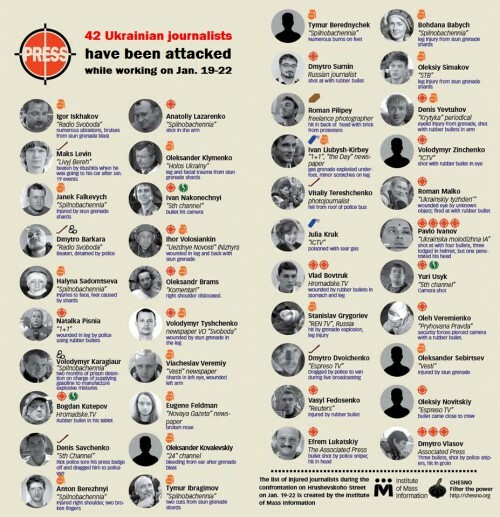 One Comment on "Ukraine: Infographics Document Attacks on Journalists"
Now there is NO press freedom in Kiev-Ukraine.